www.johnseed.com: Mitchell Johnson: "Are You Going With Me?" 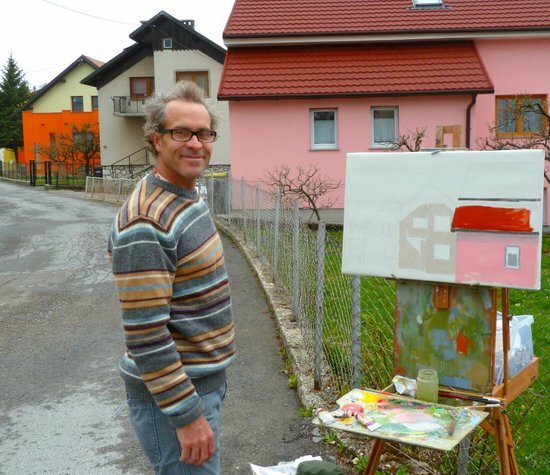 Mitchell Johnson at his easel, Postojna, Slovenia, April 2012 Painter Mitchell Johnson has worked for years in two distinct but related styles: one abstract, the other representational. Johnson has been painting in different geographic zones as well; his studio is in the San Francisco Bay area, but he often travels to Europe where he finds continuing inspiration in local zones of color. In his upcoming show at Oakland's Res Ipsa Gallery: "Are You Going With Me?" Johnson's worlds and his stylistic approaches have converged with striking results. 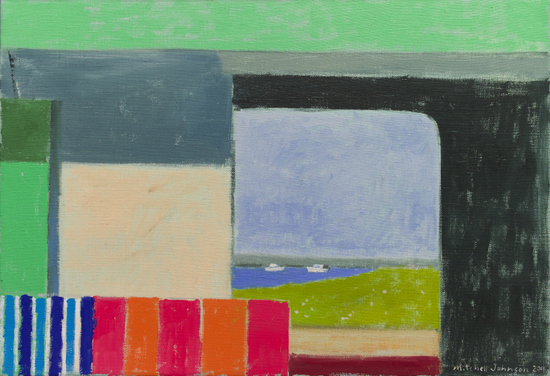 Mitchell thinks of his work as being "driven" by shape and color, and he seems to have found a highly original way of letting the two converse. I recently spoke with Johnson about the influences and ideas that have come together in his newest paintings. After our dialogue, you will find a 2009 video dialogue between Mitchell and art historian Peter Selz that will tell you more. Mitchell Johnson, "Are You Going With Me," 16 x 26 inches, oil on linen Copyright 2012 Mitchell Johnson. Photo courtesy of Res Ipsa JS: Mitchell, your painting seems to be rooted in the practice of plein-air painting. Do you start by painting what you see outdoors and then move towards abstraction when you are back inside? MJ: At this point, I primarily paint in the studio using photos, memory and drawings. I'm interested in color and shape and how paintings get put together. Twice a year I paint small paintings outside in Europe using an old French easel I've had stored in France or Italy for over twenty years. I simultaneously work on small and very large paintings, just as I work on both abstract and representational paintings. It's all about investigating color and how it always fools us. I never plan series or bodies of work or think about style and content. 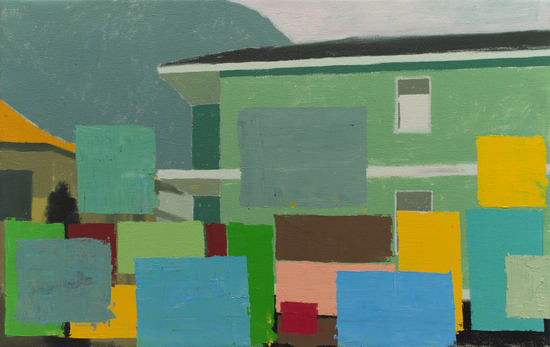 Mitchell Johnson, "Garda," 20 x 32 inches, oil on linen Copyright 2012 Mitchell Johnson. Photo courtesy of Res Ipsa JS: Italy seems to be important to you in many ways; I know for example that you love the paintings of Giorgio Morandi. MJ: To talk about Italy we have to start in France. I lived outside of Aix-en-Provence off and on in the early 90s. I had little more than an easel, some clothes, art supplies and a cheap room with a kitchen that doubled as a tiny studio. I painted landscapes outdoors in the wind and blazing sun and then back in the kitchen made little abstractions using the colors I had mixed outside. I rarely retouched my landscapes when I was inside, but the abstractions were a way of continuing what had started in situ. Then I began to paint in Tuscany, south of Siena, in 1993, and my interest in light became an obsession with color. The Italian colors, the clay earth, the buildings, the vast quilts of man-made fields really overwhelmed me. I was clueless as to how to make the shiny saturated colors coming out of my tubes comment on the experiences I was having discovering a new world. Eventually I found a direction in my painting thanks to Corot and Morandi; there's something of Fairfield Porter and of course Vuillard that I pulled from too. But Morandi was the most important. Color in Italy is almost always referencing gray or earth hues and Morandi's work helped me grasp that. 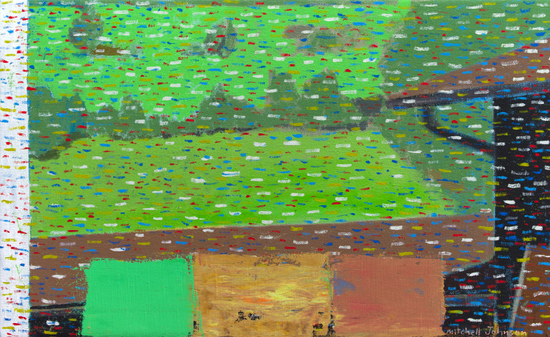 Mitchell Johnson, "Hungary," 16 x 22 inches, oil on linen Copyright 2012 Mitchell Johnson. Photo courtesy of Res Ipsa JS: When did you begin to let your works go abstract? Did it happen suddenly? MJ: The abstraction was always happening, in many ways all of my paintings are the same because they are about how do you get the color to work, which shapes have meaning. 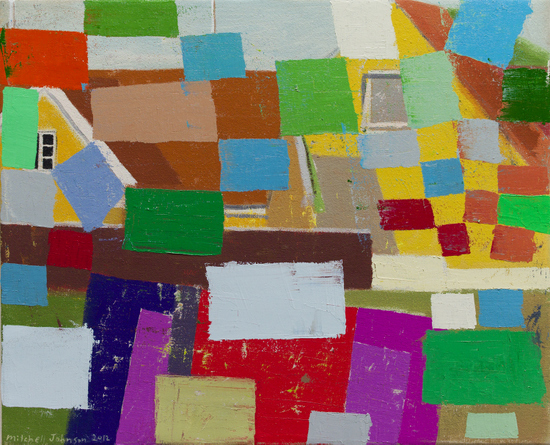 The most significant shift in my work was around 2004 when the shapes and areas of color in my paintings became larger as if I had zoomed in on pieces of my earlier paintings to draw attention to the color and the compositional choices. It seemed people were missing out on the physical and formal aspects of what was driving me. 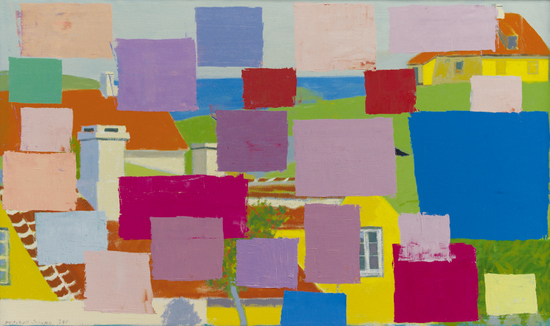 These changes followed trips to the Danish island, Bornholm, and a chance viewing of the Josef Albers exhibit at the Museo Morandi in Bologna in 2005. Mitchell Johnson, "Skagen," 17 x 21 inches, oil on linen Copyright 2012 Mitchell Johnson. Photo courtesy of Res Ipsa JS: You have a very lyric, personal approach to color. How has your color sense evolved over time? MJ: Even when I was a child, I had the desire to paint my models or toys as a way of exploring how color continually shifts, changes and deceives us. I'm not saying that I was precocious or that I could articulate what I was doing or even that I knew I would become an artist, but the motivation to paint and investigate color phenomena has always been there. The beauty of sticking with a singular pursuit is that once you get a toe-hold on an area of understanding, other people's lessons and knowledge become more accessible. Hopefully, my color sense is always evolving. I visit museums and look at other people's work to help peel another layer of the onion. When you see the range of painted color as a fixed gamut, you can enjoy the profoundness of everything from primitive Italian painting to Chardin to Albers. Mitchell Johnson, "Gammel Skagen," 24 x 40 inches, oil on linen Copyright 2012 Mitchell Johnson. Photo courtesy of Res Ipsa JS: Tell me about your schooling. What teachers influenced you? MJ: I studied painting and drawing at Randolph-Macon College in Virginia and Ray Berry first showed me images of Chardin and Morandi. Ray took a group of us to see the huge Impressionist exhibit at the National Gallery in 1986. I wouldn't have made it to Parsons in New York without the help of Jo Weiss at the Washington Studio School in DC where I went after R-MC. Then at Parsons, Paul Resika, Leland Bell and Robert De Niro, Sr. helped me start the path I'm still traveling. I've been very lucky. 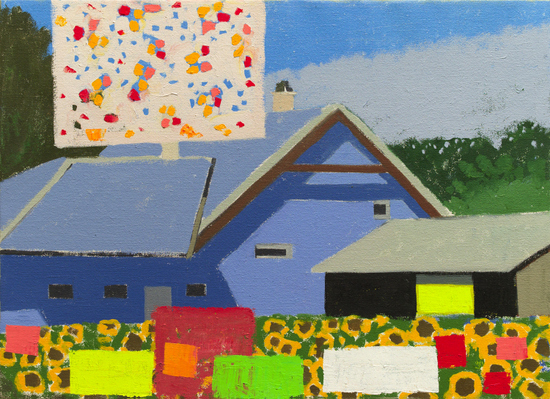 Mitchell Johnson, "Tyrol (Confetti)," 16 x 26 inches, oil on linen Copyright 2012 Mitchell Johnson. Photo courtesy of Res Ipsa JS: Tell me about the connections between your current show and music. MJ: My mother was a piano teacher and I tried many instruments when I was young and couldn't keep with it. There was always music in our house. I usually have music playing when I'm in the studio but it's a very broad range - there are currently Fritz Kreisler CDs stacked next to Joy Division, Aimee Mann and the Beastie Boys. The music motivates me and keeps me company, but it also helps with the problem of how do you keep reaching for new ground and new insight. I have no interest in style, but I'm very determined to keep growing because that is the source of freedom. The new paintings are pretty strong flavored, but they are also full of subtlety. I'm hoping that the awareness of how important music and color are to me, helps viewers to appreciate that this work is about much more than style. Knowing that the paintings are connected to music provides some context. 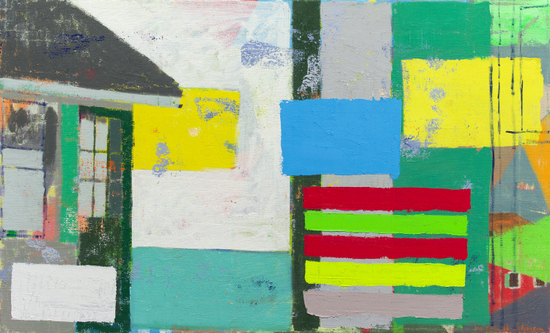 Mitchell Johnson, "Truro Doorway," 15 x 22 inches, oil on linen Copyright 2012 Mitchell Johnson. Photo courtesy of Res Ipsa JS: I know you were recently in New York City. Did you get to see many exhibits? What's your feeling about how painting is now perceived? MJ: I don't think painting ever went away, but it is definitely everywhere in the art world at the moment and there's such an amazing range represented. In New York I saw the complicated William Bailey show at Betty Cunningham, Adolph Gottlieb at Pace and the unusual Hofmann show at Ameringer Yohe. When I went to see Susanna Coffey's exhibit at Steven Harvey's gallery, there was a small Gandy Brodie painting, Apple Blossoms, in the back room and this is the piece I can't stop thinking about. Brodie's painting was an important reminder of what painting can do. Painting is this fantastic antidote to the instantaneous quality of our new internet/GPS world. It is problematic and uncompromising and it demands time and energy in a way that much of our activities no longer do. I believe that is why its quite in vogue again - because like great songs, we need paintings in our lives to remind us about what really matters. Excellent Paintings. Excellent insights to painting. Thank You.